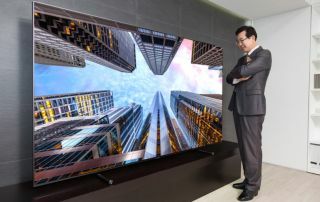 Samsung's Q9 television hits humongous 88in screen size | What Hi-Fi? It has 4K resolution with HDR support, naturally, and can support the entirety of the DCI colorspace - totalling over one billion colours. How big should a TV be? 49in? 55in? 75in? Pah. Measly little things, dwarfed by the might of Samsung's 88in, $20,000, 'perfect colour' QLED Q9 TV. It's now available in South Korea and at Best Buy in the United States. As you'd expect it has a 4K resolution with HDR support and, according to Samsung, it can support the entirity of the DCI colorspace. This means it achieves 100 percent colour volume (over one billion colours) to display images precisely as they were intended. There's also built-in wi-fi, plus DTS Premium Sound 5.1 from four speakers and two woofers,(if you're more concerned about specs than goggling at the size of your new telly). Still, price-wise this TV is still pretty reasonable. Compared to those with frames made of gold and diamonds, or TVs the size of football goals, that is. The QLED Q9 is making its European debut at IFA at the end of this month. So stay tuned for all the Massive TV News and more besides.